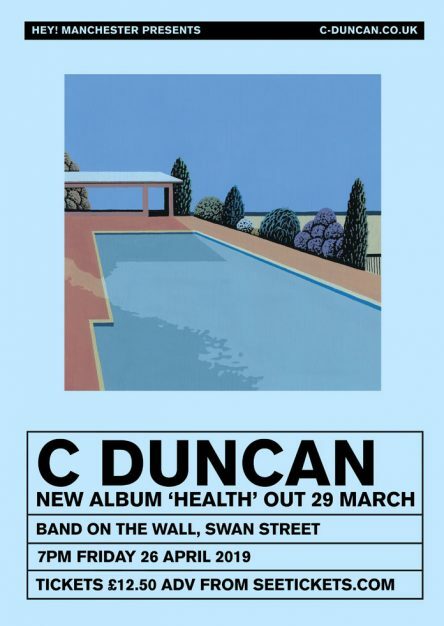 Set for release via FatCat Records on March 29th, C Duncan’s highly anticipated third album sees the Scottish multi-instrumentalist ditch his bedroom studio and work with other producers, engineers and musicians for the first time. “This was the biggest shift in dynamic for me,” he explains, “having always worked alone, it was a daunting prospect but one I knew I had to explore.” Navigating themes of love, anxiety and sexuality, ‘Health’ – produced by Elbow’s Craig Potter – is a deeply personal record that delves into a world Duncan had previously felt uneasy exploring. “Writing it was a very cathartic process. It helped me through a lot of tough times and also to celebrate the good,” he continues. Warm and harmonically rich, Duncan delightfully juxtaposes the vibrant and wholesome aesthetic of the album with an often-darker lyrical undertone, pushing himself to refine and explore new ways of writing. As the sole protagonist of his self-carved niche, ‘Health’ sees Duncan evolve and expand its parameters in mesmerising fashion. Out on Friday 18th January, the album’s first single ‘Impossible’ documents the highs and lows of a long-distance relationship with an ex-boyfriend. “At one point he was working night shifts, so it was very hard to communicate with each other because our schedules were completely out of sync. I wanted to see him all of the time, but it was impossible to do at that point in time,” Duncan explains. Strings and oddball psychedelic sounds combine with equal vigour, it’s jarring rhythmic art-funk of offering an accurate portrayal based on personal experience. Following the Mercury-nominated debut ‘Architect’ (2015,) an it’s impressive follow up ‘The Midnight Sun’ (2016,) ‘Health’s’ soaring tapestries achieve what Duncan set out to. “With album 3 I wanted to take a more direct approach, adding even more layers but thematically and lyrically laid bare. Having someone else to bounce production ideas off was really eye-opening for me. In the past I had been very controlling about how everything would sound but ‘Health’ really showed me the benefit of working with others and made the whole process much less isolating,” he explains. Packed with fresh ideas and buzzing with invention, ‘Health’ combines syncopated art-pop piano rhythms with breezy, undulating heartbreak ballads executed with acute precision. As always Duncan has contributed all the artwork surrounding the release, and the colourful and natural aesthetic is reflected in the instrumentation and lyrics.